The thermal joining process from EMAG has its main application in the manufacture of high-precision powertrain components. It is also suitable for workpieces that are subject to high torque rates and great dynamic loads. In the continuing development of its systems EMAG is focusing on the individual solution. The application of thermal joining technology leads to a signifi cant reduction in component weight and a high degree of functional density. 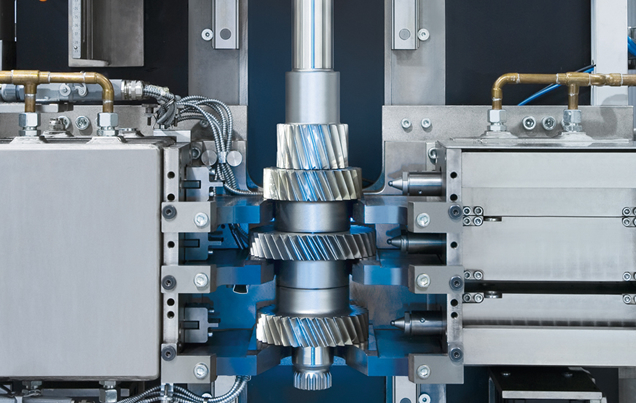 Whether control cams or gears have to be mated with shafts or shafts fitted into housings, the preheating and joining technique is a safe and continuous process. The advantage of EMAG’s technology lies in the preheating unit, which is geometrically matched to the workpiece and features an integral temperature control. EMAG’s patented system is used to join complex precision components. For the manufacture of shafts, in particular, this technology can be applied. The EMAG preheating and joining technique is characterised by a stress-free joining process. An optimal combination of robot and specially designed gripper system makes it possible to work with a joining clearance of < 15 μm. The flexibility of this concept allows for greater freedom in the design of camshafts and has its advantage in medium batch production with frequent resetting to accommodate different shafts. The thermal joining process combines flexibility and productivity, as the user benefits from constructional and production-specific freedom and from short cycle times. Whilst one cam is fitted, the next one is already being preheated. By equipping the joining machine with a number of preheating units the process can be scaled to suit requirements.